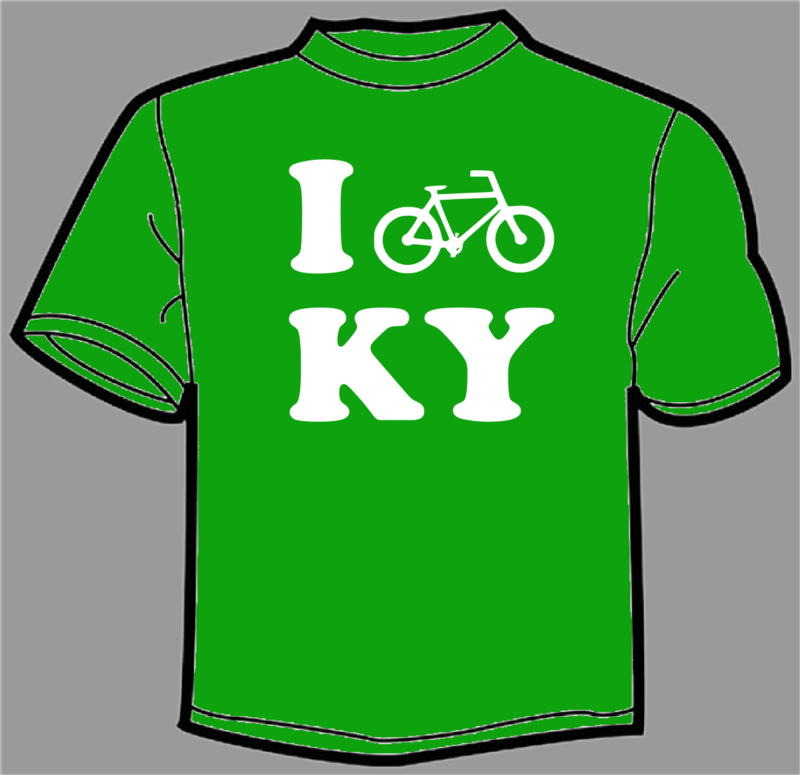 I Bike KY and Hope you will, too. 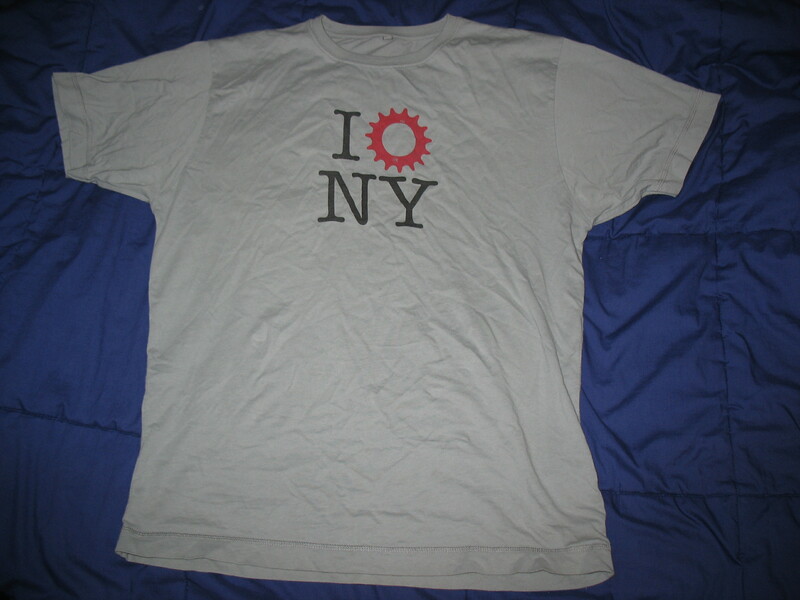 In celebration of National Bike Month and local Bike Lexington events, I decided to finally make the t-shirt that I’ve been itching to wear, and found a good cause for it to support. The shirts go on sale Friday, May 14th for $15. Let me know if you want one! While I’m excited to wear these shirts, and see them on other cyclists in KY, what really moves me is the opportunity to use this to benefit less fortunate cyclists in the area. While many commuter cyclists (like myself) choose their mode of transport based on preference, for others, it is the only viable option. The latter group is well-represented by men at Lexington’s Hope Center. Walking into the building on Loudon Ave, the dozens of bikes overflowing from racks make it obvious that residents rely on two-wheeled, self-propelled vehicles. Unfortunately, many of the bikes are in disrepair, inhibiting residents from effectively transporting themselves around Lexington. While at a BPAC meeting on May 7th, I learned about an initiative to help the residents of the Hope Center overcome this challenge. By providing bicycle repair equipment and lessons, residents will be able to maintain their own bicycles to ensure a reliable, sustainable transportation option. Think teach-a-man-to-fish (we just need a few fishing poles). With help from a few of the local bike shops, all that’s needed to make this a reality is $300. That’s where you come in. By helping me sell 60 t-shirts, we can raise enough money to accomplish this first goal. Then, phase 2: lighting systems for all the Hope Center’s commuter cyclists! My friend Ryan likes MTB, too. 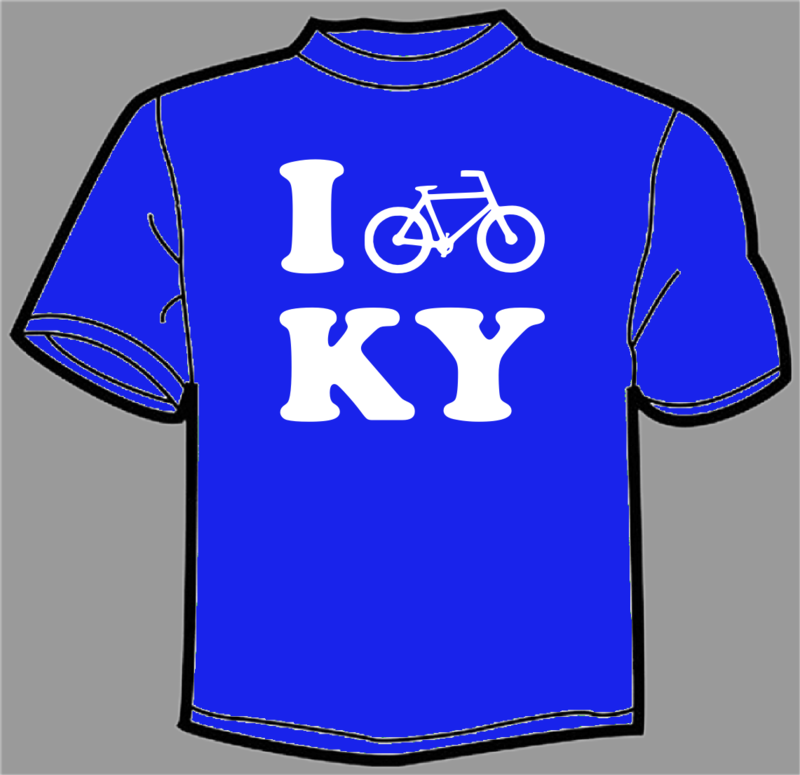 During Now What Lexington, Scott Clark and I discussed the mountain bike situation in Lexington. There is currently only one recognized trail in the city, at Veterans Park. Our friends at OutrageGIS have compiled a very nice map of the park, displaying the nearly 2.5 miles of singletrack. While I am proud that there is at least one trail in our city, it is rather limited in both distance and degree of difficulty. When I lived in Louisville, I was blessed with the ability to ride from my home to the Briar Hill trail (very technical, beautiful area), or take a short drive from work to trails at Cherokee or Seneca parks. 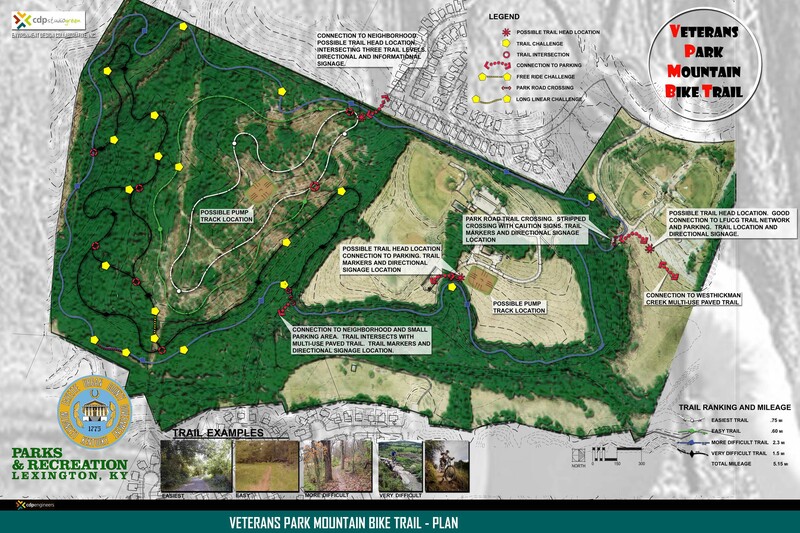 Besides Veterans, the next closest trail to Lexington is in Frankfort’s Capitol View park. It is a great trail, but hardly a convenient after-work jaunt. I participated in a QOL focus group with Jerry Hancock yesterday, and didn’t get to speak with him before I left. Jerry mentioned the desire to modernize Lexington’s park system, and I was curious if this includes plans to add new Mountain Bike trails? During the Creative Cities Summit and Now What Lexington, Scott Clark brought to my attention that Lexington has only one MTB trail (Veterans Park), and a short, entry level one at that. I noticed that it is not even designated on your trails list. While I am excited about the quality of life benefits brought on by the pavement-type Legacy and Town Branch trails, I think that our city would be further enhanced by the addition of at least one new off-road MTB trail. Mountain biking is very popular among the creative class, the type of people our city is seeking to attract. Similar to hikers, mountain bikers crave an intimate experience with nature, and are inclined to preserve and maintain the environments in which they ride. 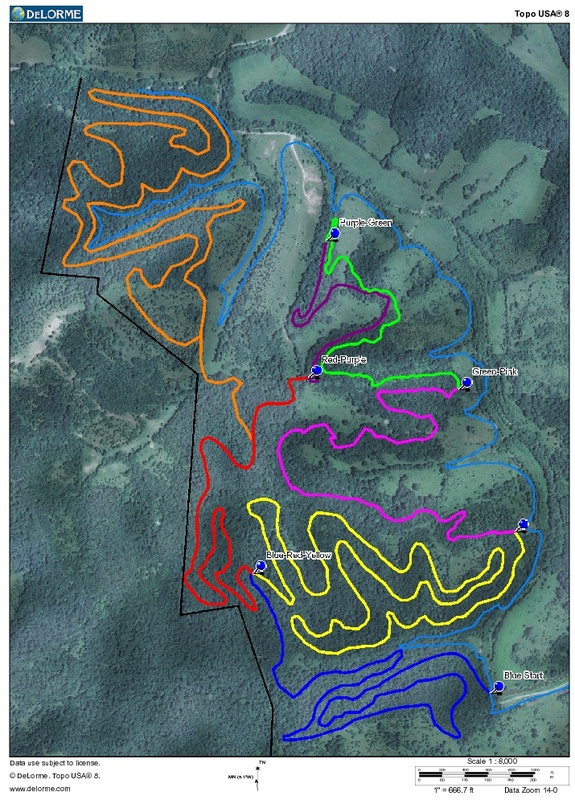 As Central Kentucky seeks new ways to connect citizens and visitors to our region’s natural beauty, I think we would be remiss to move forward without plans for a new MTB trail in Fayette County. How can I help make this a reality? I am excited for a response from Parks and Rec as to how citizens can help add a new trail and improve the quality of life in Lexington. I think this project will be a good complement to improved nightlife options in downtown, a more appropriate variety of housing near the city’s core, better public transportation, and stronger ties between the city and its three institutions of higher education, especially from the point of view of the creative class. 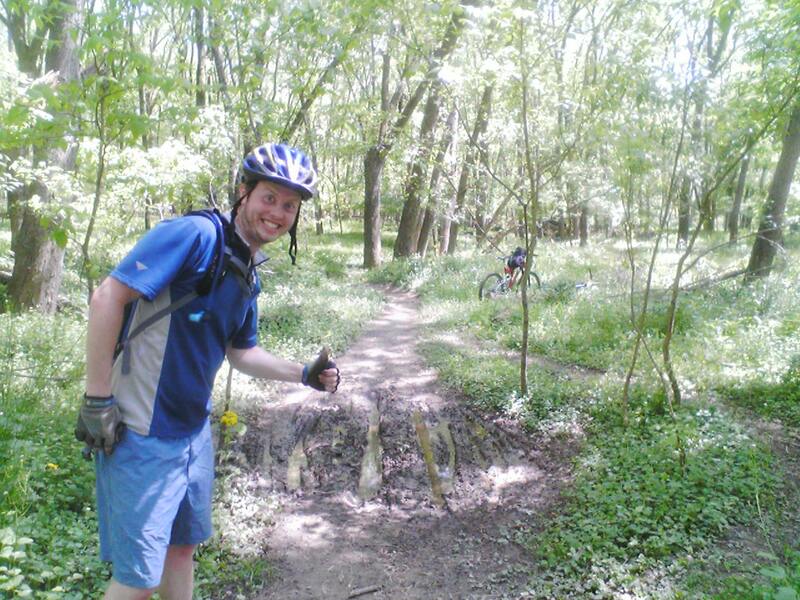 I am neither an expert on trail building nor the most avid mountain biker in Lexington. I’m just a guy who loves every minute I spend on two wheels, and wants to share that joy with others. Will you help me? Thank you for your interest in mountain biking in Fayette County and Veterans Park. The MB trails at Veterans developed unofficially over the years and are not designed to recognized safety and sustainability standards. Therefore, we didn’t feel it was prudent to “sanction” their use officially. However, we currently have a contract with CDP Engineering to re-design the trail(s) and expand them to include 4 levels of difficulty as per national mb standards. We’ve had 2 public meetings which were heavily attended by members of the local chapter of the National Mountain Bike Association. Using input from the association members and that of general public novice riders who also attended the meetings, we developed the attached plan. We are in the final stages of revision to a couple sections and working toward advertising bids for construction very soon. We anticipate that current available funds will only cover the initial construction of the trail surface (and we won’t be sure how much until bids come in). We have talked to many local mountain bikers about organizing volunteer work groups to build many of the “events” along the more difficult trails once the trails are in place. I hope this information is helpful. Please don’t hesitate to contact me again if you have questions. Check out Skull Buster trail volunteers, and their work building a new set of MTB trails in Scott County, near Stamping Ground. Here are some pics from today’s 2ndSunday event. It started with an hour-long bike tour of Lexington’s Higher Education Triangle (Transy, BCTC, UK), then returned to a pedestrian-only Short Street for the Best of the Bluegrass Chili Cookoff and some live music from BOBO. I can’t think of a better way to spend to enjoy 72 and sunny. April 8th was One Day Without Shoes, spearheaded by TOMS Shoes to evangelize the plight of children around the world who don’t have shoes. Hitting close to home, Booneville, KY was the site of a TOMS shoe drop. For these kids, lack of shoes means reduced access to education and increased incidence of disease. For me, walking barefoot was an interesting exploration of the most basic form of human transportation. Events like this are the epitome of social entrepreneurship, combining the support of a worthy cause with a brilliant marketing plan and a sustainable business model. That’s why TOMS founder Blake Mycoskie‘s picture hangs on our Rockstar Wall at Awesome Inc, and why I’ll be highlighting his story in my talk at Saturday’s Appalachian IDEAS conference. Thanks to “Cool”, avid TOMS fan and member of Team Alpha, I was inspired to spend most of my day barefoot. It was amazing how strange I felt in the beginning, leaving my house without shoes on. I quickly discovered how painfully uneven the sidewalks are in my neighborhood. Next came the realization of how much slower I was moving compared to my normally hurried pace. I noticed my feet garnering plenty of strange looks as I progressed through campus to meet up with 50 other barefoot marchers. It would have been great to see more people participate in the walk, but it sparked plenty of curiosity from onlookers, who were eager to learn why a pack of young people were traversing UK’s campus with naked feet. After the walk, I continued on to Awesome Inc. At the completion of my 1.3 mile journey, my dogs were tired and slightly blackened. After a few hours of touch screen business development work, I had a hankering for a sandwich. Although weary of potential rejection, I strolled into the nearest sandwich shop, and was delighted to order my favorite #13 sub without a hitch. I’m not sure they even noticed I was barefoot! Sandwich in hand, I set out to find the latest copy of Ace Weekly to read about “Techsington”, which highlighted some of the great things going on for Technology Month in Lexington. Once I finished lunch and discussed user interfaces with some brilliant UK Computer Science seniors, I set out for a half-mile walk to help Shannon, one of the founders of Nextington 4, move some furniture. Following the return trip to Awesome Inc and a shoeless meeting, I finally gave in and put on my sandals for the No Mercy gaming event at Bakers360. The great thing about this day without shoes is that it still hasn’t ended. When I take a shower tonight to wash the road grime off my feet, I will be thinking about the kids who don’t have that opportunity each day. When I wake up tomorrow and my feet are still sore, I will compare my meager daily trek to the meandering voyage that kids in Ethiopia take across harsh volcanic soil. Will I buy a pair of TOMS Shoes tomorrow? Probably not. But the next time I’m in the market, I will think about how my feet feel right now, and consider whether Sketchers or Asics are doing anything to prevent that feeling for kids around the world. Raised aggregate: deceivingly painful, unpredictable. There’s a reason I seldom walk barefoot on my parent’s driveway.